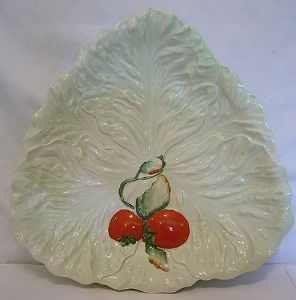 This is a really delightful 1950/60s Lettuce & Tomato Salad Dish from Carlton Ware. The design was probably the third in their 'Sald Ware' range and was first manufactured in this design in the early 1950s. The Salad Bowl (or Traingular Plate/Dish) has a green ground representing a lettuce leaf and at one end are a couple of embossed tomatoes with their foliage. This range was discontinued in 1976 after consideration concerning the red paint. It measures 10 inches x 10 inches (15.5 x 15.5 cms) and is in perfect condition with no crazing. It is backstamped correctly showing it to one of the many Australian registered designs. It is shape number 2093.